Gordon D'Arcy is the only player from the home nations among the five nominations for the International Rugby Board's player of the year award. England failed to register a nomination in any of the major categories. D'Arcy will be up against South Africans Schalk Burger and Marius Joubert, Australian centre Matt Giteau and French flanker Serge Betsen. South Africa's Jake White and France's Bernard Laporte are among those nominated for coach of the year. White led South Africa to the Tri-Nations title in his first season in charge while Laporte guided the French to the Six Nations Grand Slam. They are joined by New Zealand Sevens coach Gordon Tietjens and Tomaz Morais who guided Portugal to victory in the European Nations Cup on a shoestring budget. Less than a year after sweeping the board at the 2003 awards in Sydney, England's only nominations come in the Sevens where captain Simon Amor and Ben Gollings have been short-listed for Sevens player of the year. 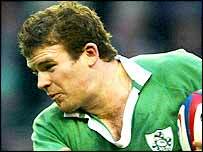 D'Arcy proved an instrumental figure as Ireland landed their first Triple Crown since 1985 and was voted the outstanding player of the RBS 6 Nations. South Africa, France and Portugal have all be nominated for the team of the year prize, which will be awarded on the night by Martin Johnson, England's World Cup-winning captain. In Sydney last November, Johnson took to the podium to accept that same award on behalf of England, with Jonny Wilkinson claiming the player of the year prize and Sir Clive Woodward named coach of the year. The winners of the 2004 awards will announced at a gala dinner on 28 November at London's Royal Lancaster Hotel. Ireland have also a nominee in the under-21 player of the year with the brilliant Dublin Unviersity number eight Jamie Heaslip named alongside New Zealand duo Jerome Kaino and Luke McAlister. Player of the year: Serge Betsen (France); Schalk Burger (South Africa); Gordon D'Arcy (Ireland); Matt Giteau (Australia); Marius Joubert (South Africa).